The experiences of students and staff of the Alice Springs CDU campus and adjacent Centralian Senior Secondary College (CSSC) will be improved with the creation of a consultative committee. Formed in November 2007, the group will meet twice each school term with recommendations sent to the university management group and the Department of Education, Employment and Training. Student and staff input from both organisations will ensure a balanced input into the group. Members from CDU include campus administrator Dianne Underwood and coordinator of community pathways Karina Betschart. CSSC representatives include business manager Fay Saint, assistant principal Tony Collins, and course careers transition adviser Judy Hoban. Student representatives of CDU VET and undergraduate courses, and CSSC are being sought to join post-graduate representative Jane Walker. Improvements to the café, library space, evacuation procedures, car parking facilities and facilities of the shared oval have been identified. Campus Administrator Dianne Underwood said the formation of the committee was an important step in forging positive future relationships. “The group provides a joint proactive focus for the campus and will enable students and staff members from broad areas to have real input in the decision-making process,” she said. Fay Saint said the CSSC Council was committed to engaging the community and maximising the use of shared campus facilities in conjunction with CDU. 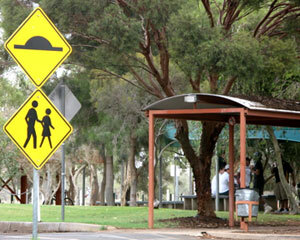 “We are united in working closely with the Alice Springs Town Council, Department of Planning and Infrastructure and local groups to make sure students and the wider community access quality facilities within a safe environment,” she said. The committee's formation is part of CDU's commitment to community engagement across education and industry sectors.